TAIWAN: Canadian electricity producer Northland Power has formed a 60-40 joint venture with Singaporean partner Yushan Energy to develop two offshore wind projects by 2023-2024. The Hai Long joint venture is investigating two sites in the Taiwan Strait, west Taiwan. The projects will have a combined 1.2GW of capacity and are due online in 2023 and 2024. Northland Power, the 60% owner of the joint venture, said the projects are still in early-stage development, with several permits still outstanding and a financial commitment to the projects is yet to be made. "Although Taiwan has excellent offshore wind power resources, domestic enterprises remain far from developing and utilising it. By introducing advanced foreign experience, expertise and technologies, Taiwan seeks to provide value and benefits to global energy developers, while also upgrading the domestic industry," the joint venture said. The Canadian energy firm is unlikely to be the only western experience in this project. By utilising the excellent wind regime in the Taiwan Strait, Hai Long looks to build on its international experience and close working relationships with local contractors to develop a model of engineering which will place Taiwan at the forefront of offshore renewable energy development in the region," said Hai Long project director Tsung-Hua Chen. "We are pleased to see that some local geophysical and geotechnical surveyors, encouraged by us, have formed a company in partnership with international enterprises. "They will introduce new vessels, the latest advanced equipment, and quality control systems to Taiwan in order to dramatically enhance both the quality and the quantity of marine geological surveys," Chen added. 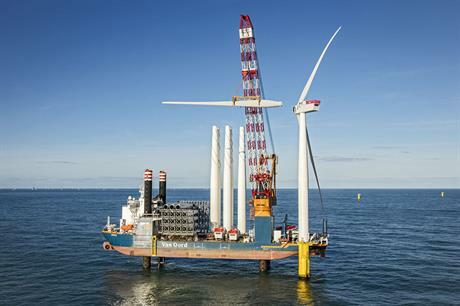 Northland has made significant inroads in European offshore sector, recently completing the 600MW Gemini project off the Netherlands. It also owns stakes in the 332MW Nordsee One and 252MW Deutsche Bucht project. Northland aren't the first offshore wind majors to move in to the Taiwan market. In January, Dong Energy and Macquarie Capital acquired the Formosa 1 project. The site currently has two Siemens 4MW turbines installed, but there are plans to expand the project to 120MW. And in early May, Danish investment fund manager Copenhagen Infrastructure Partners (CIP) acquired three offshore wind sites under development in Taiwan.